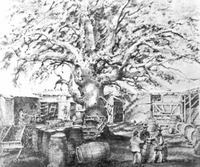 That massive sycamore tree that was 60' high and 200' diameter) sat alongside a wider, concrete-free, Los Angeles River and served as the site of council for the basins first residents; thousands of Tongva (people of the land). One of the many villages that made the Tongva tribes was Yang Na who were on the high ground near what's now the Civic Center –– making it the first settlement in the city. The people of Yang Na met under that large sycamore tree, a symbol of the fertile land, and one would guess a big provider of shade during the summer heat. After the Franciscan fathers, led by Junípero Serra, arrived to “save” the tribes, the Tongva people were renamed after Mission San Gabriel Arcángel and called the Gabrielino. And just as the Indians received a Castilian name, so did the tree. It was renamed “El Aliso” (the alder). Missionaries up and down the state continued settling Spanish owned land with presidios and pueblos –– including an expedition of recruited families accompanied by soldiers who made their way from Mexico, to Mission San Diego, then up to Mission San Gabriel. On September 4, 1781, they walked from Mission San Gabriel to a spot near the river and founded El Pueblo de Los Angeles. Down the slight bluff from this plaza, the sycamore tree was the last refuge of tradition for the remaining natives. Defending it’s sovereignty, Mexico’s sought overland settlers and maritime traders to develop an economic base after the territory of California was sold to the US. 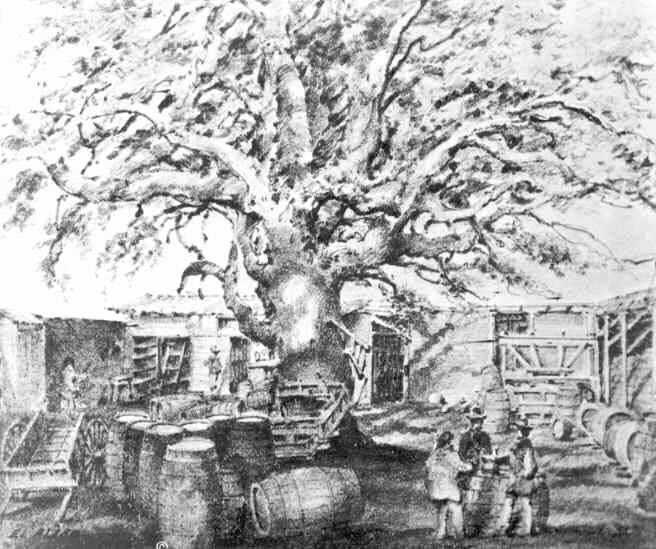 By then the Aliso tree was providing shade for a wine cellar. The wine was produced from the surrounding vineyards planted by a European settler. That settler, Louis Vignes, arrived at El Pubelo De Los Angeles on December 5, 1831 during Mexico’s reign. Originally from Bordeaux, France, he first traveled to the Sandwich Islands where he sold goods as a trader before coming to Monterey, California. Hearing of the rich farmland he moved south to the city of Los Angeles was growing out to the intersection of Spring and Main street on the south and further out from El Pueblo to the north. On land east of the present location of Alameda Street, Vignes purchased one hundred and four acres and named it the Aliso Vineyard. “With my knowledge of vine and orange cultivation and of the soil and climate of California,” Vignes said to a guest in 1833, “I foresee that these two are to have a great future; this is just the place to grow them to perfection.” The road marking the north end of his land was named Aliso Street, after the large tree sitting on his purchased tract. “Don Louis del Aliso” –– so named by the local residents –– built his courtyard around the Aliso tree to shade his product. After a long career of agriculture and wine making (and a visit to Mission San Gabriel to grab some samplings to start a private orange grove), Vignes put up his “desirable property, El Aliso” for sale on June 7, 1851. 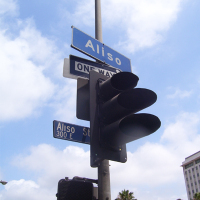 It was developed for housing that by 1884 made the area, still known as the Aliso tract, a "working class neighborhood" mixed with manufacturing. One of the most profitable items produced in the area west of the river from Aliso Street, then south to what is now 3rd St was beer, ale and wine. “El Aliso” was finally cut down, weakened from age and neglect to make room for the Philadelphia Brew House, a brewery later operated by Maier and Zobelein. Later, The Philadelphia Brew House was replaced by The Maier Brewing Company. 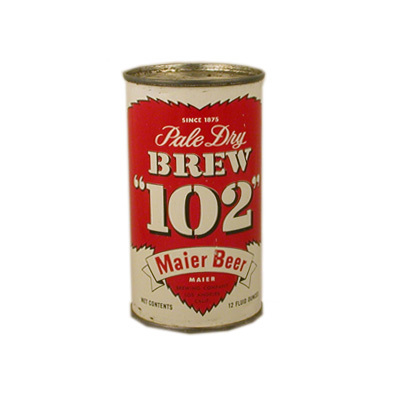 To pick up sales after Prohibition, The Maier Brewing’s ad agency renamed the formally popular Maier Beer, Brew “102” and kept it a low cost “working man’s” beer. Brew 102 must have had some sort of political clout to have the newly constructed 101 freeway swerve around it’s factory. Most of Aliso street is under the 101 freeway now. Vignes Street starts by my parking lot gate and leads to the site where the brewery, courtyard and "El Aliso" once stood. It's story worthy to tell under a large sycamore tree near a river.